The image was taken by Jason Matias at the Wild Horses Monument on the Columbia River Gorge in Washington. 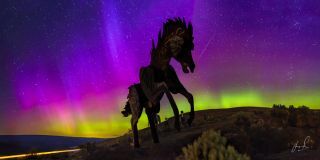 A horse statue appears to rear up as a spectacular purple aurora lights up the night sky in this stunning view by a photographer in Washington. The image was taken by Jason Matias at the Wild Horses Monument on the Columbia River Gorge near Vantage, Washington. Matias pieced together 15 separate images to create this dazzling panoramic view - which he titled "Wild Horses" - during a recent spike in aurora activity. The Wild Horses Monument, also known as 'Grandfather Cuts Loose the Ponies' is an art sculpture project consisting of 15 life-size steel horses which appear to be galloping across a ridge above the Columbia River. "When we arrived atop this steep rattle snake habitat of a plateau in the middle of the night I immediately went for the cliff where I knew I'd find this horse and I knew I'd be alone," Matias said. "The catch, was that to capture this equestrian I had to stand on a speck of rock jutting from the face of cliff in the dark. All I had was a Canon 7D and a 35mm lens, there was barely enough room for my tripod, and open air on all sides." Auroras are caused when charged particles from the sun slam into Earth's magnetosphere and interact with particles in our planet's atmosphere. At different altitudes, the solar particles are likely to collide with different types of atoms, producing different colored auroras. Editor's note: If you have an amazing photo of the night sky that you'd like to share for a possible story or image gallery, please contact managing editor Tariq Malik at spacephotos@space.com.